It is a matter of heart-rending grief that on Monday, 15 October 1984, the day of Kṛṣṇa-ṣaṣtḥī, on the occasion of Śrī Śrīla Narottama Ṭhākura Mahāśaya’s disappearance, a supremely dear disciple of my most worshipful śrī gurupāda-padma and a recipient of his affection left this world. Atapproximately six in the evening, Śrīla Prabhupāḍa’s last sannyāsī disciple, our godbrother parama-pūjyapāda tridaṇḍi-svāmī Śrīmad Bhakti Vicāra Yāyāvara Mahārāja, entered nitya-līlā in Śrī Śyāmānanda Gauḍīya Maṭha in Medinīpura while fully conscious and remembering the beautiful lotus feet of Śrī Śrī Guru-Gaurāṅga Gāndhārvikā-Giridhārī-jiu amid a grand saṅkīrtana performed by the resident devotees of the maṭha. By going to Purī-dhāma, I attained everything—a relationship with a bona fide guru and the opportunity to hear the glories of the Lord. Jagannātha is the friend of the wretched and the savior of the fallen. He attracted me and gave me the feet of a bona fide guru. When I knew I had no hope without a guru, I went searching for a bona fide spiritual master. In Jagannātha-Dhāma, in 1333 (Baṅgābda), I received my first view of the lotus feet of my śrī guru. Oṁ Śrī Bhaktisiddhānta Sarasvatī, is the direct representative of Viṣṇu. 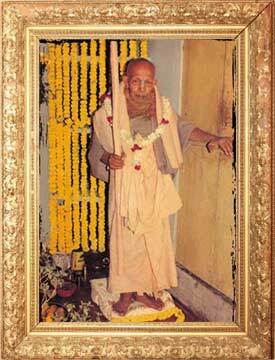 He alone is my guru, this Śrīla Prabhupāda. From this song, we learn that pūjyapāda Mahārāja went to Śrī Jagannātha-kṣetra and took shelter at the lotus feet of the Lord of the universe, Śrī Jagannātha-deva, with the hopes to soon meet a bona fide guru. Śrī Jagannātha, who is supremely compassionate and affectionate to those who take His shelter, quickly arranged for him to meet a bona fide guru and come in contact with His identical manifestation, the most worshipful Śrī Śrīla Prabhupāda. The verdict of the scriptures is that guru is the form of Kṛṣṇa. In the form of guru, Kṛṣṇa bestows His mercy on the devotees. Pūjyapāda Mahārāja appeared in a religious brāhmaṇa family with thesurname ‘Pāṇḍā.’ The family lived in a small village called Duramuṭha, which is in the Kāñthi subdivision of the Medinīpura district of West Bengal. His mother and father, who were both devotees, were amazed to see their darling son’s natural attachment to the Lord from early childhood, and they always prayed at Bhagavān’s lotus feet to grant him a long and devotional life. When he began his studies, his teachers and guardians were amazed at his extraordinary brilliance. Cultivating knowledge as a student for many years only strengthened the boy’s natural desire to worship Bhagavān. It was as if the Lord personally sent him to Śrī Puruṣottama-dhāma, where by the boundless mercy of Śrī Puruṣottama Jagannātha-deva, he attained the fortune of accepting shelter at the lotus feet of a bona fide guru. Śrī Hari is like a desire-tree, and He never leaves the desires of His devotees unfulfilled. Rather, He fulfills them quickly. In 1926, on the auspicious occasion of Śrī Śrī Gaura’s appearance, he received śrī harināma mahā-mantra and īṣṭa-mantra dīkṣā from śrī gurupāda-padma, and thereafter became known as Śrī Sarveśvara dāsa Brahmacārī. Onthe instruction of Śrīla Prabhupāda, he engaged himself with great conviction in the ritual worship (arcana) and service of Śrī Śrī Guru-Gaurāṅga Gāndhārvikā-Giridhārī-jiu three times daily at the principal temple, ākaramaṭha-rāja Śrī Caitanya Maṭha in Śrīdhāma Māyāpura. He also diligentlystudied Śrī Harināmāmṛta-vyākaraṇa and other scriptures at the maṭha’s institute for higher learning. Never wasting any time in sleep, laziness or idle gossip, Śrī Sarveśvara Brahmacārī spent all of his time in the practices of worship as directed by his śrī guru; serving Śrī Hari, guru and Vaiṣṇavas; and studying Śrī Bhagavad-gītā and Bhāgavatam. In this way, he exhibited the exemplary character of a resolute sādhaka. His character was exceedingly pure and spotless, and he was the embodiment of peacefulness, gentleness and sweetness. His exchanges with everyone were innocent and affectionate. The Vaiṣṇavas of the maṭha and pious people who came to hear hari-kathā were attracted by the simplicity with which he presented scriptural conclusions regarding spiritual relationship (sambandha), practice (abhidheya), and the ultimate goal (prayojana). He would especially captivate and attract the hearts of audiences by singing in his honey-like voice the sweet songs of the previous Vaiṣṇava ācāryas. 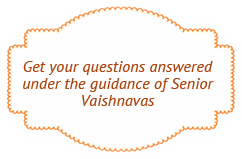 unprecedented lectures on scriptures like Bhagavad-gītā and Śrīmad-Bhāgavatam. I personally witnessed pūjyapāda Yāyāvara Mahārāja attract thehearts and minds of the chairman, the chief guest, and all the earnest listeners gathered at an illustrious assembly of learned scholars at Śrī Caitanya Gauḍīya Maṭha in southern Kolkata. Even while he was ill, with the help of his scholarly disciples, pūjyapāda Yāyāvara Mahārāja published several books, one of which was his Śrī ŚrīBhāgavata-gītāmṛta. In the first and second sections of this book, he publishedseveral songs he composed himself. Of the contents therein, the poetic and simple explanations of Bhagavad-gītā and the four-verse (catuḥ-ślokī) form of Bhāgavatam are particularly worthy of careful study. Today, with the loss of such an exalted devotee and kindred spirit, my heart feels especially hollow. The Gauḍīya Vaiṣṇava community is gradually becoming bereft of devotees who relish pure bhakti-rasa. The diminishing number of earnest speakers and listeners dedicated to the conclusive message of pure devotion as propagated by Śrīman Mahāprabhu is a great loss for the world. The void left by this loss is unable to be filled, and it heralds dark days and great misfortune. These dark days keep any chances for good days at bay. Mercifully, Kṛṣṇa gave me [Haridāsa Ṭhākura’s] association. By Kṛṣṇa’s independent will, our exchange has ended. Haridāsa was the crown jewel of this Earth. Without him, it is as if she is bereft of all jewels. Truly, Vaiṣṇavas like nitya-līlā-praviṣṭa tridaṇḍi-gosvāmī Śrīmad Bhakti Dayita Mādhava Mahārāja, nitya-līlā-praviṣṭa tridaṇḍi-gosvāmī Śrīmad Bhakti Hṛdaya Vana Mahārāja, nitya-līlā-praviṣṭa Śrīmat Kṛṣṇadāsa Bābājī Mahārāja and nitya-līlā-praviṣṭa tridaṇḍi-gosvāmī Śrīmad Bhakti Vicāra Yāyāvara Mahārāja are saviors of this world and are utterly irreplaceable. They can be compared only with themselves. 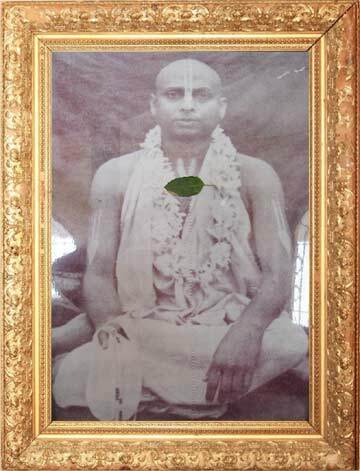 The founder of Śrī Caitanya Gauḍīya Maṭha, nitya-līlā-praviṣṭa pujyapādatridaṇḍi-gosvāmī Śrīmad Bhakti Dayita Mādhava Mahārāja and pūjyapāda Yāyāvara Mahārāja were especially close friends. During the various special festivals organized in Śrīla Mādhava Mahārāja’s centers, pūjyapāda Yāyāvara Mahārāja would come and grant all his godbrothers and their disciples the great fortune of his rare association. He would especially visit the Kolkata maṭha often, even apart from festivals, and bless us with his divine association.Today, recalling the heartfelt, genuinely affectionate words he spoke during such visits causes my heart to become exceedingly agitated and overwhelmed with emotion. We viewed pūjyapāda Yāyāvara Mahārāja as our worshipful Prabhupāda’s youngest son, whom he treated with great respect and heartfelt affection. Śrīla Mahārāja was approximately seventy-eight at the time of his disappearance. Although he was somewhat younger than me in age, in terms of knowledge and bhajana, he was millions of millions of times richer and more exalted. Alas, I am so unfortunate! I could never have imagined he could have left us so soon, thereby drowning us forever in an ocean of sorrow. My inability to foresee this deprived me of receiving his darśana one last time. Surely, he regarded all of his godbrothers equally, but it seems he looked upon such a fallen, destitute and unfortunate wretch as me with more affection. Whatever the case, I anxiously pray at his lotus feet that he may bestow his causeless mercy upon me and absolve me of any offenses I may have committed against him, whether knowingly or unknowingly, for he is the topmost among Vaiṣṇavas and ignores the faults of all others. Śrī Yāyāvara Mahārāja is a dear and intimate associate of our supremely worshipful Prabhupāda, who has surely granted him the eligibility to enter the pastimes of Śrī Śrī Rādhā-Govinda. May he supplicate at the feet of the most compassionate Śrīla Prabhupāda to grant a genuine glance of mercy upon this wretch. Śrīla Mahārāja’s conviction in performing nāma-bhajana was highly exemplary. Even when he was very ill, he set an example of performing one lakh nāma daily. Both paramārādhya Śrī Śrīla Ṭhākura Bhaktivinoda and Śrī Śrīla Prabhupāda outlined that distinctions between Vaiṣṇavas should be determined according to the varying degrees of taste they have in nāma. Should a person be devoid of conviction in nāma-bhajana, neither Śrīla Bhaktivinoda Ṭhākura nor Śrīla Prabhupāda would ever accept their pretense of rāgānugā-bhakti as genuine rāga-bhakti. In pūjypadāda Yāyāvara Mahārāja’s absence, the maṭha and mandiras he established appear as if lifeless. Like the residents of those institutions, we too have become melancholy in the absence of our Vaiṣṇava friend. My sole entreaty at his lotus feet is that he infuse his potency into his disciples and bring them back to life. I pray he may cast a glance of mercy toward us as well, and thereby grant us enthusiasm in bhajana. The disciples of pūjyapāda Mādhava Mahārāja and also the new ācārya of Mādhava Mahārāja’s institution are all the recipients of pūjyapāda Yāyāvara Gosvāmīpāda’s affection. They are all anguished by his separation and are praying for his mercy. Everyone’s anxious prayer is that he may shower his affection upon them from that eternal abode.